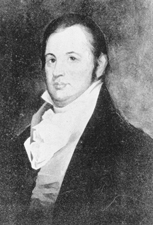 POPE, John, a Senator and a Representative from Kentucky; born in Prince William County, Va., in 1770; completed preparatory studies; studied law; moved to Springfield, Ky.; admitted to the bar and practiced in Washington, Shelby, and Fayette Counties; member, State house of representatives 1802, 1806-1807; elected as a Democratic Republican to the United States Senate and served from March 4, 1807, to March 3, 1813; served as President pro tempore of the Senate during the Eleventh Congress; member, State senate 1825-1829; Territorial Governor of Arkansas 1829-1835; resumed the practice of law in Springfield, Ky.; elected as a Whig to the Twenty-fifth, Twenty-sixth, and Twenty-seventh Congresses (March 4, 1837-March 3, 1843); chairman, Committee on Territories (Twenty-sixth Congress); unsuccessful candidate for reelection in 1842 to the Twenty-eighth Congress; died in Springfield, Washington County, Ky., on July 12, 1845; interment in the cemetery at Springfield, Ky.
Baylor, Orval. John Pope, Kentuckian: His Life and Times, 1770-1845. Cynthiana, Ky.: The Hobson Press, 1943; Blakey, George T. Rendezvous with Republicanism: John T. Pope vs. Henry Clay in 1816. Indiana Magazine of History 62 (September 1966): 233-50.